NOTE: The Access Code has to be entered EXACTLY as given. 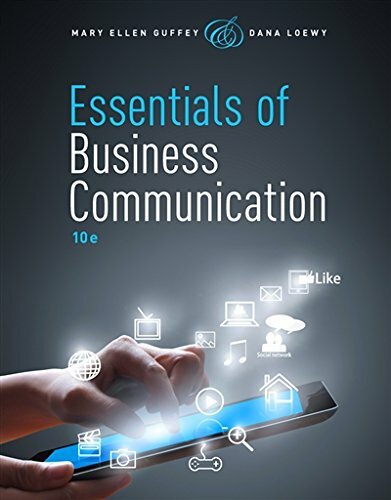 Strengthen your business communication skills with the streamlined presentation and unparalleled learning resources found only in the award-winning ESSENTIALS OF BUSINESS COMMUNICATION, 10E. This unique four-in-one learning package includes an authoritative text, practical workbook, grammar/mechanics handbook at the end of the book, and premium Web site (access code is included with new copies of the text). You'll learn basic writing skills and then apply these skills to a variety of e-mails, memos, letters, reports, and resumes. Realistic, updated model documents and new exercises and activities introduce the latest business communication practices. Extraordinary exercises help you build confidence as you review grammar, punctuation, and writing guidelines. You'll find increased coverage of professional social media communication, electronic messages and digital media. Please note that the Premium Website access code is included in new copies of the text. Access codes and supplements are not guaranteed with used items. If you have any questions about this product by Guffey Mary Ellen, contact us by completing and submitting the form below. If you are looking for a specif part number, please include it with your message.